What are some things you might run into? The retrospective should create a safe space for people to share their honest feedback on what’s going well, what could be improved, and generate a discussion around things that should change next time around – with actionable items documented. Retrospectives can be used for any type of team working on a shared project, but the sprint retrospective is especially optimized for an agile production team. It is one of the ceremonies that Scrum and Kanban teams leverage throughout cyclical product development. It creates a safe, blameless space for team members to share their valuable feedback. It allows the team to document wins and areas of opportunity. It provides an actionable list of next steps and identifies who’s owning which item. It identifies small, incremental changes that can lead to larger waves of improvement. It allows teams to iterate on their process to amplify results. It allows opinions to be heard. It helps the team mature. It makes each sprint better than the last. Both the sprint review and the sprint retrospective are scrum ceremonies used around the world by production teams. While similar – in that they both take place at the end of the sprint – they are separate and distinct exercises and should always be treated as such. Once the sprint review is over, the sprint retrospective typically takes place. This is where the team reflects on the work they just completed, offers up kudos to what went well, and identifies suggestions for improvement moving forward. It should be action-oriented, blameless, and adapted to fit your team’s needs. It is typically facilitated by the Scrum Master or DPM. Folks on the periphery of the project do not need to – and should not – join. Combat apathetic participation by mixing things up! The outcomes of a good retrospective can be reached by adapting different exercises and questions. There is no “one ring to rule them all” when it comes to retrospectives for a reason – you should iterate on the way you run this. Check out some good inspiration here, here and here. 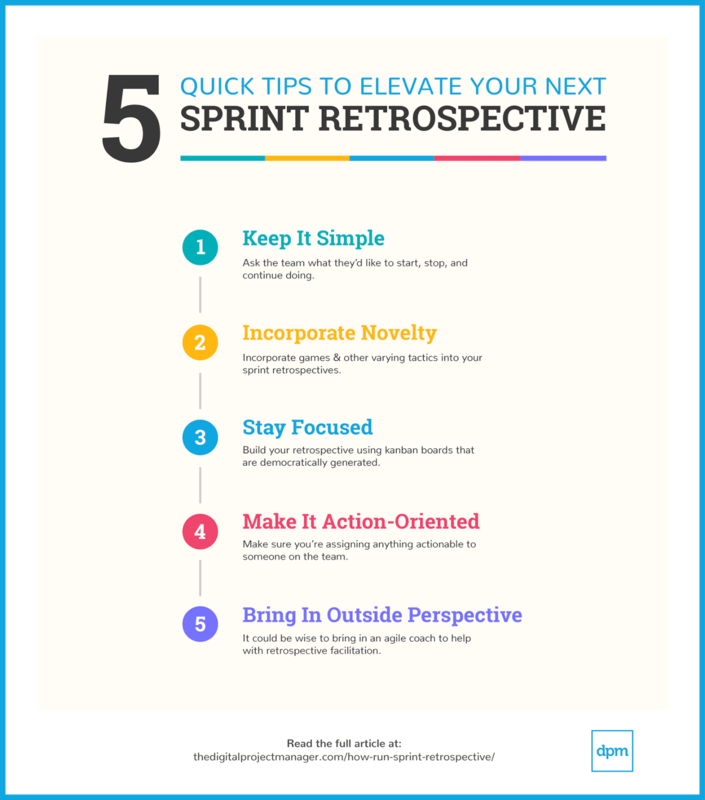 As I set out to write this article, I reached out to several team members in the organization to chat about their experiences with sprint retrospectives. I was curious to find out what different roles (designer, developer, and project manager) thought about this ceremony. If you’re just getting started with retrospectives or looking to mix things up, talking directly with team members can be a good place to start. I asked them three simple questions. Using the Lean CoffeeTMapproach, retrospective agendas can be built using kanban boards that are democratically generated. This might be good for a group who can’t seem to stay on topic or who tend to spend too much time on a particular discussion point. Be sure to use different colored sticky notes and markers and identify a volunteer to document outcomes. Most simply, but perhaps most importantly, make sure you’re assigning anything actionable to someone on the team. They don’t all need to fall on the project manager. In fact, they shouldn’t. The conversation can be as constructive and helpful as possible, but the ripples will not be felt unless the change is implemented across the team. Keep a list visible for everyone to see, and make sure that expectations and deadlines are set. If you’re looking for some backup, it could be wise to bring in an agile coach to help with retrospective facilitation. There are a lot of experts out there who can tease out some of the finer points of the conversation and help to drive change for the team. An outside perspective can be a huge turning point! This may come at a premium (and may not be required unless there are significant struggles), so another great solution would be to invite another teammate to the conversation. Those unrelated to the project can help shed a light on the important comments and act as a neutral third-party. If you don’t have access to a team member, you can look into using a retrospectives tool that’s designed to give structure and support for the process.